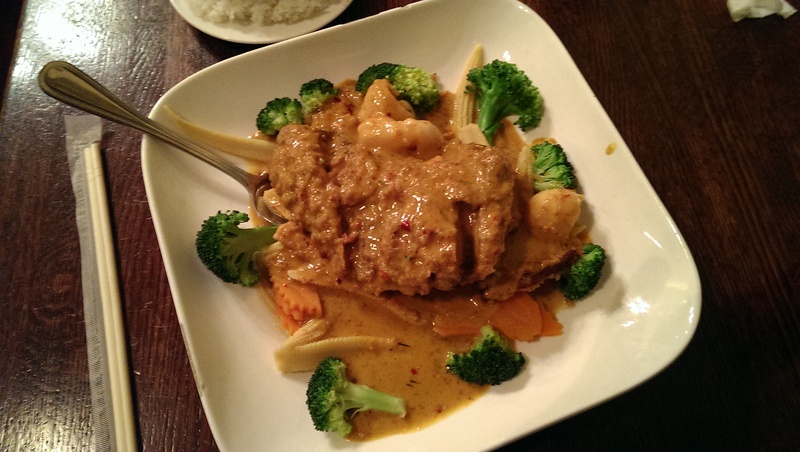 Wheaton, Maryland is home to two of my favorite Thai restaurants. As luck would have it, they are right next to each other. 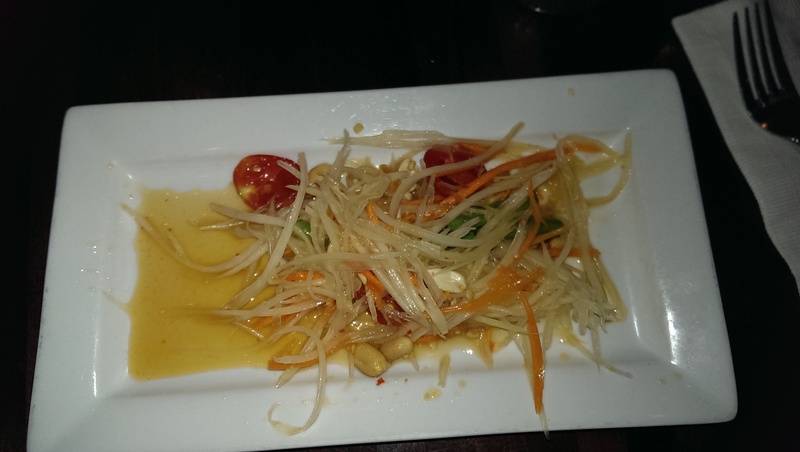 NAVA Thai, located in a beautiful yellow panelled building with red accents, is a place my friends and I visit often. It has the usual assortment of satays, noodle, and curry dishes. In addition to those, it has rarer dishes such as crispy duck and Bar Mee Lad Na, a dish made with stir fried vegetables and the meat of your choice, all surrounded by crispy fried egg noodles. It is delicious. Another favorite is their curry puffs. They have both meat and vegetable kinds, but my preference is the vegetable one. 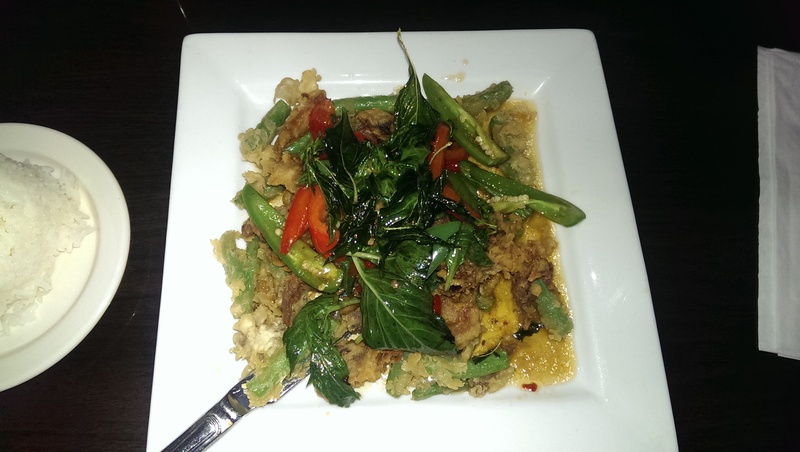 My friends recommend the drunken noodles, the chicken satay, and the Pad Thai. 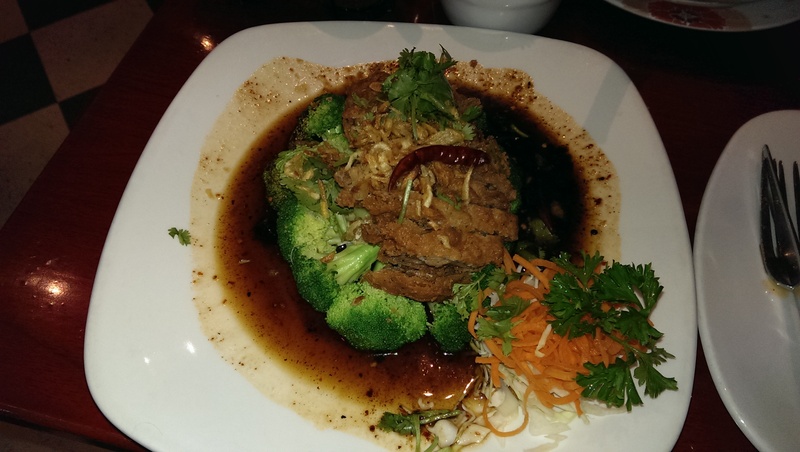 The service is always friendly, and the place accommodates large crowds quite nicely. Right next to NAVA Thai, behind a Thai grocer, is s small restaurant called Thai Taste. It is easy to miss, but is a great place to eat. What sets Thai taste apart is that they serve Thai street food. I’ve seen dishes there that I have not seen elsewhere. Two of them, pictured below, are Lucky Bag and the Thai Taste Herbal Bowl. The Lucky Bag is a mix of minced chicken, sweet potatoes, and onions, seasoned with Thai spices, wrapped in rice paper, and deep fried. 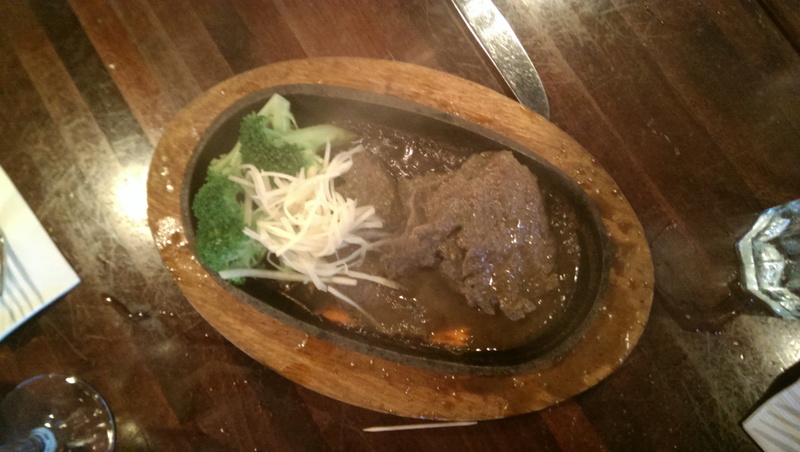 The herbal bowl is a mix of vegetables and meat served in a light sauce. Both dishes are delicious. 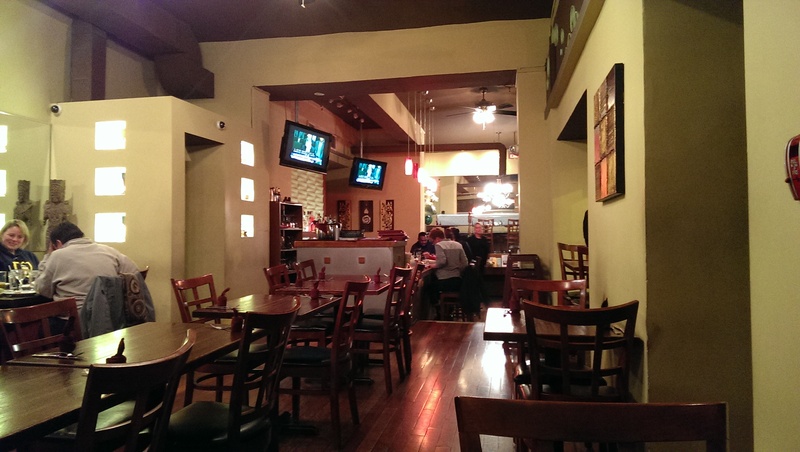 I don’t go to Thai Taste as often as I would like as the place is quite small, and cannot accommodate large crowds. But when I do, I always enjoy it. 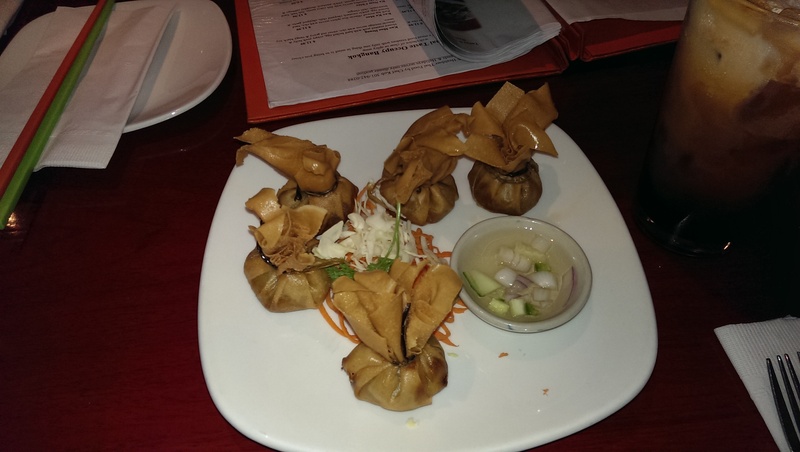 I do want to give a shout out to Ruan Thai. I have not had a chance to go there myself, but it comes highly recommended by several of my friends. It is reported to have great curries. The next stop on my Thai tour is the Maryland city of Silver Spring, just a short drive down Georgia Avenue from Wheaton. 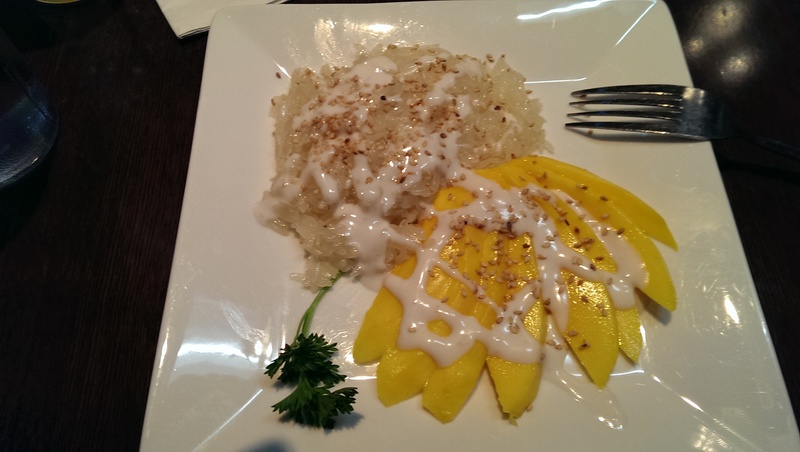 A major border city with DC, it is a mecca for great Thai restaurants. Located in a cozy red brick row house on Bonifant street, in one of the older buildings in the area, is Ruang Khao. The building it is in was formerly occupied by Thai Derm, a Silver Spring restaurant that had been consistently serving great food for decades. Other than serving Thai food, the new restaurant is unrelated to the old one. Ruang Khao has a lot to live up to, and for me the jury is still out. 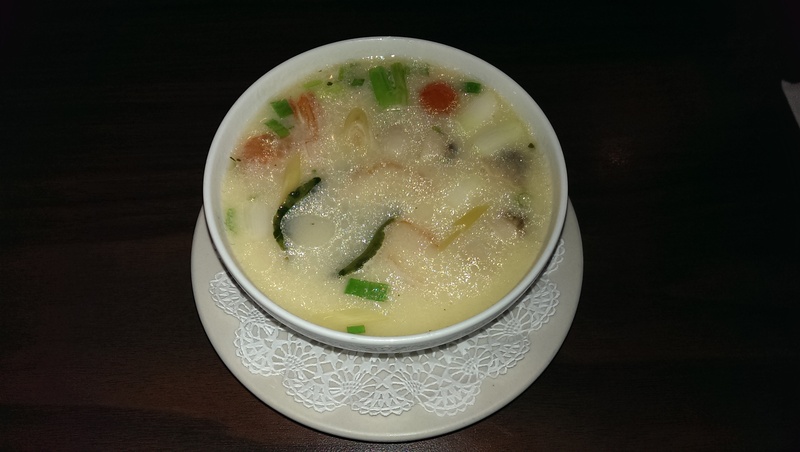 The pictures below are of the lemon grass soup (Tom Yum) and one of the chef’s specials, the Asian pumpkin. The dishes are good, but not as spicy as I would like. Just around the corner on Georgia Avenue, right next to the former location of the dearly departed Piratz Tavern, is another Thai Restaurant called Charm Thai. It is a little more upscale than the rest, but the food is good quality. 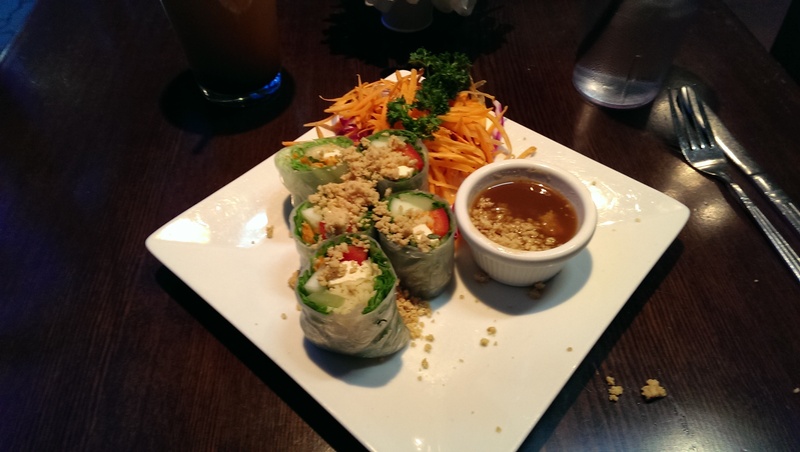 Personal favorites are the spring rolls and the mango sticky rice, which is superb. On Thayer Avenue was another Silver Spring institution, the Thai Market. It had been serving the region since the early 80s. Alas, the market has closed. I was told it was because the owner of the market has retired, but this article indicates that construction in the area was the culprit. However, the diner that was inside the market is still open, in a renovated portion of the building. The restaurant is called Lamoon Thai. 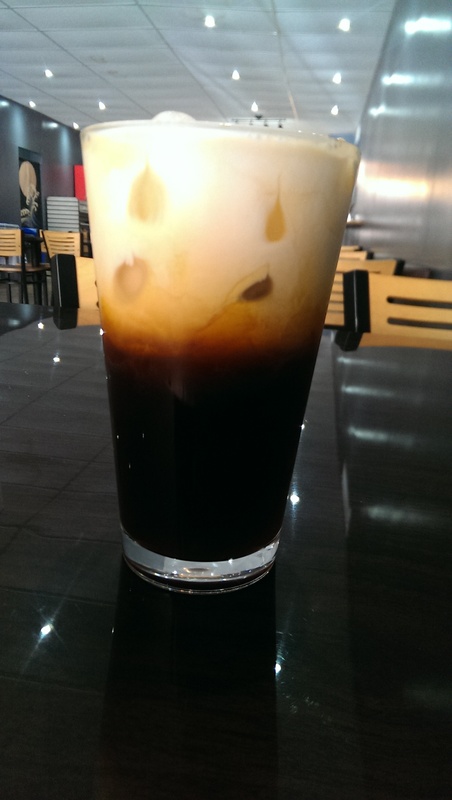 I’ve always like this place as it served exotic soups, great satays, and the best Thai ice tea around. The remodeled restaurant has a wider variety of dishes. 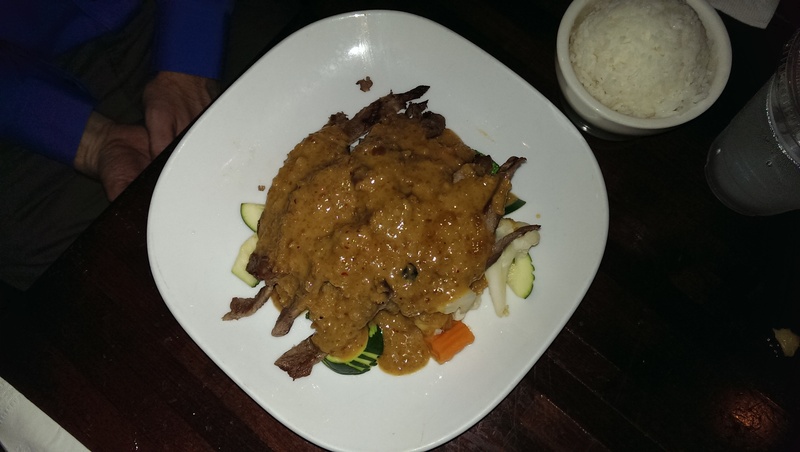 Pictured here is Ka Prow Ped Krob, crispy duck served in a basil sauce. 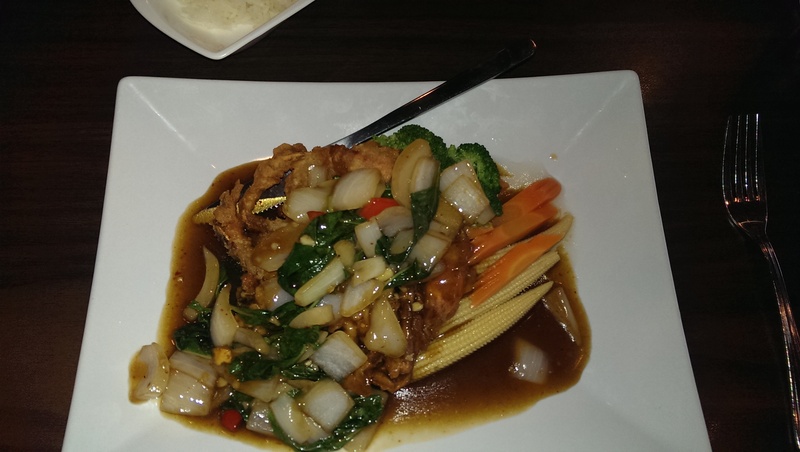 Finally, there is Thai at Silver Spring, located in the current heart of downtown Silver Spring, along Ellsworth Avenue. I actually haven’t been to Thai of Silver Spring all that often, but I’m including it because it is a mainstay for some friends of mine. Pictured here are steamed dumplings (great for kids), a papaya salad, and two beef dishes: Pra Ram Beef (beef with peanut sauce) and sizzling ginger beef. 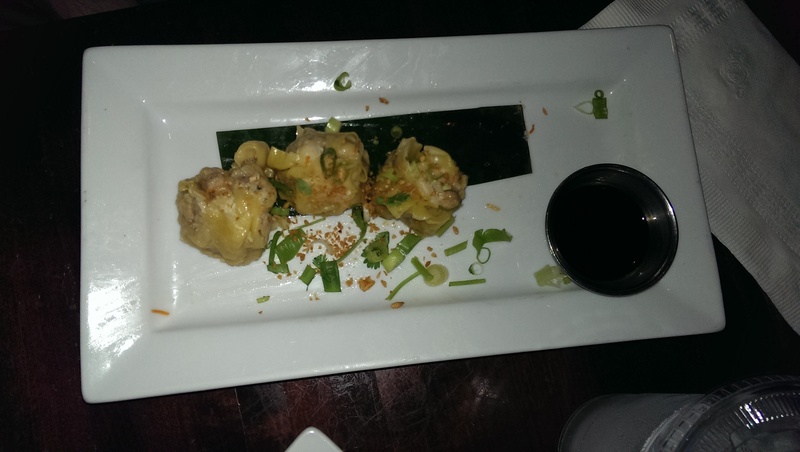 Leaving Maryland and heading into the district, you can find one of my perennially favorite Thai restaurants in Dupont circle. Affectionately called “Downstairs Thai” by my friends (because you have to go down a flight of stairs to reach it), its actual name is Bangkok Thai. One of the reasons I like it is that when you order a dish Thai hot, it actually comes out spicy. I still think they tone it down a bit for us Americans, but it is still quite hot. Bangkok Thai has a variety of dishes. I like the seafood, and recommend the Pattah. The crispy duck is also dynamite. The soups are great as well, chock full of meat and vegetables. My friends highly recommend the Pad Thai and the Pineapple fried rice. 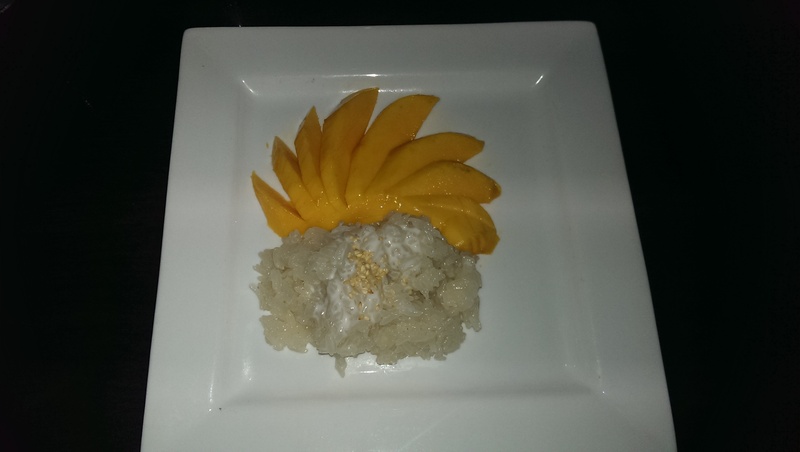 We’ve gone to Bangkok Thai in large groups, and they’ve always handled it graciously and with quick service. On the other side of DC, in Chinatown right behind the Capitols’ Arena, is a nice little Thai restaurant called Absolute Thai. It is easy to miss ; the only reason I know of it is that a friend recommended it to me. I’ve been there a couple of times, and have enjoyed the meal each time. This was long enough ago that I do not remember the name of the dish. I believe it was soft shell crab. If you are in this part of DC, it is a good place to go for Thai food.